Philips shrinks Fidelio SoundSphere to create mini monitor speakers | What Hi-Fi? Philips has a habit of creating unusual designs, as exemplified by its SoundSphere range of speakers. 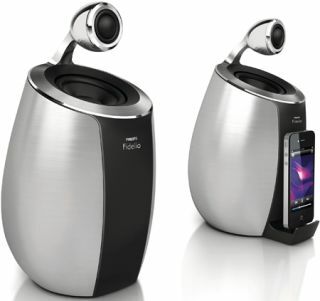 Now it's shrunk the design to create the new £399 Fidelio DS6600 mini docking and PC speakers. Based on the same acoustic principles as the larger DS9800W system, the DS6600 is intended for use as near-fleild monitors or in a small room. There's a direct digital connection for your iPod/iPhone on the slide-out dock, or a USB connection and 3.5mm jack for hooking up other portable devices. The speakers themselves feature the same 25mm soft-dome tweeter used in the larger DS9800, again mounted in a single piece, aluminium enclosure supported by a rigid arm. There's a 6.8cm mid/bass driver in the main cabinet. Philips aays the rounded cabinet design, with aluminium finish, is intended to reduce the influence of standing waves and other internal resonances on the sound. As for power, the DS6600 is biamplified with a Class D, 50W digital amplifier. You can buy the Philips DS6600 now for £399 from the Apple Store. Discover more about the new Philips Fidelio range in our earlier news story.